The road twisted and turned before us as my eyes were glued to the landscape. Tall pines and Douglas firs spread out their branches, looking proud of their height and stature as we zoomed below them to our destination on the two lane road. We caught up to a log truck bogging on the hills and reduced speed. I wouldn’t consider myself a “save the trees” person, yet, I couldn’t help but wonder where those logs came from and if their absence left their home barren. The road widened and then the truck pulled off, letting the vehicles behind pass. In front of the logging truck, we drove further on. Suddenly, we pulled off the side of the road onto a gravel parking lot. Other cars were already parked, a restroom sat off to the side and dirt trail led to a wooden sign that read “Beacon Rock.” We had arrived. From the side facing the road, Beacon Rock looked like…well, a rock. The images you see on the internet with stairs, ramps and switchbacks look nothing like the towering fortress you see from where you park. If not for the markings and signs giving away its location, most might pass it by. One would never guess what waits on the other side! We walked along the dirt path to the trail that immediately immersed you in the feeling of being in a state park. Huge trees. Lush green vegetation. A quiet solitude that causes you to forget the busy highway you just came from. 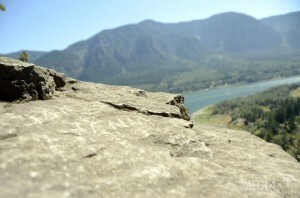 The trail leads to the backside of the rock, the side facing the Columbia River. There you begin the ascent. The hike/climb, whatever you choose to call it, isn’t so bad. Yes, you will eventually reach the top of a rock 848 feet above sea level, but it’s made easy because the trail is constructed of ramps and not many steps. 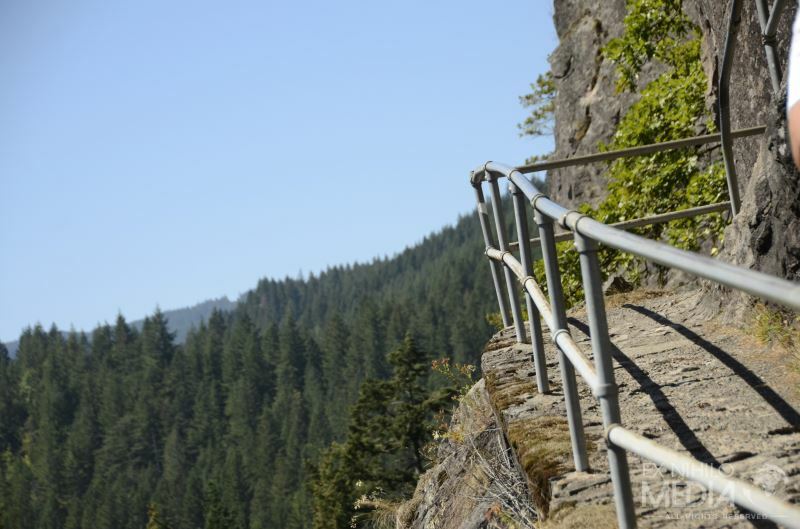 These ramps lead from one switchback to another until you reach a rather level path that twists you around to the road side for a while, but don’t worry, your final destination will once again be a panoramic view of the Columbia River. As you hike up, you’ll notice that solid rock doesn’t hinder the growth of plants at all. I guess this is where I should pass on the warning given to me – don’t touch all the vegetation, much of it is poison ivy and/or poison oak! Yet, in the midst of the bad you can find the state flower of Oregon, The Oregon Grape. It looks a lot like Holly and I’m told that it’s beautiful in bloom. As we made our way to the top, the view of the river was amazing. We learned that the river wasn’t a result of erosion, but a glacier. You can tell by the shape of the valley – if it’s in a “U” (what Geologist call “U-shaped valleys”) then it was carved out by a glacier. At one time, a glacier filled the whole valley and when it moved, the force of all the materials in the glacier took out everything in its path, creating a valley with steep sides and “U” shape. There’s a story to that and our friend knew it well. In the 1800’s, as folks came west on the Oregon Trail they would come to the river, build rafts and float down the Columbia, sometimes, all the way to Portland. Because of the distinct shape of Beacon Rock, it became a landmark, a beacon to those who could recognize it and tell where they were on their journey. Thus, the name Beacon Rock. On top, one might expect a grand lookout that was spacious and could hold many people like most touristy places. I kind of expected that, but when we stood on top I found the summit mostly untouched from its original state. Trees closed in on three sides with one window to absorb the view from. The ground was jagged rocks piled together that created natural seats, depending on your imagination. We ate a sack lunch up there and enjoyed the view, taking a lot of photos and reading the information on the sign. 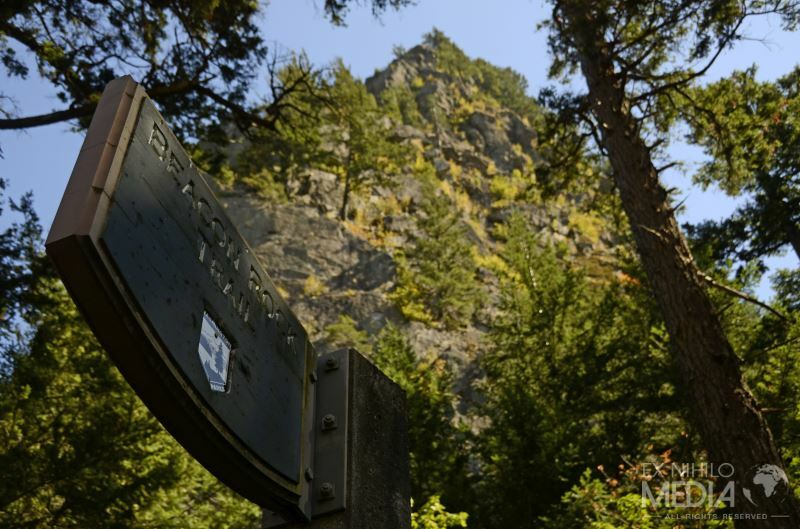 The Lewis and Clark Expedition arrived at Beacon Rock on October 31, 1805. 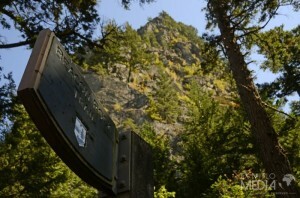 Henry Biddle purchased Beacon Rock for $1 in 1915. The trail to the top is three quarters of a mile. The rock is considered a basalt volcanic plug.